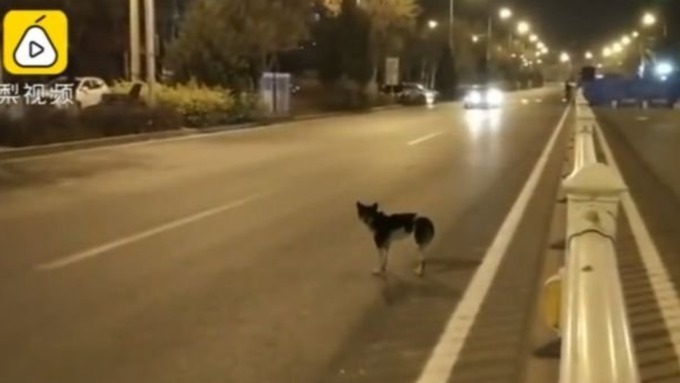 For more than 80 days, a loyal dog has been waiting in the middle of a road in Inner Mongolia, for its owner to return. But the owner died in a car accident on the busy road in Hohhot on August 21. Since the accident, the canine has been waiting for its owner every day, according to a news platform in China, Pear Video. Footage of the dog published by Pear Video has been widely shared and viewed more than a million times on China’s micro-blogging site Weibo. A reporter from China News, who visited the site, said dog-lovers had been leaving food for the dog by the road. A taxi driver told the news agency, the dog has been seen sitting at the railing in the middle of the road since the accident. Many have expressed concern about the animal’s welfare, hoping drivers would be careful to avoid the dog as they drove past. Volunteers have reportedly been reaching out to the owner’s family and friends in the hope of finding a home for the dog. Hope this dog is caught soon.